이 나무는 높이 9.0m, 가슴높이 둘레 2.0m에 나이는 150년으로 추정되는 노거수(老巨樹)이다. 한 아름이 훨씬 넘는 큰 규모에 줄기의 골 모습도 특징적이고 수형 또한 아름다워 우리나라 산사나무를 대표하며, 엄귀비의 무덤 앞에 위치하는 문화적 가치도 있다. 산사나무는 늦봄에 피는 하얀 꽃과 가을에 익는 아기사과 모양의 빨간 열매가 특징이다. 그 열매는 산사자(山査子)라 하여 해열제로 쓰인 기록이 조선왕조실록에 있고 산사주(山査酒)를 담가 약술로 먹기도 한 전통나무이다. 그러나 현재는 산사나무 중 이 나무만큼 크게 남아있는 것이 거의 없을 정도로 드물게 되었다. 문화재 노거수는 크기가 큰 은행나무·소나무·느티나무 등 당산목 위주로 보존되고 있는 반면, 민속생활과 함께 해온 다양한 종류의 전통나무들이 생활양식의 변화로 이용이 줄면서 방치되거나 사라지고 있는 실정이다. 영휘원 산사나무는 생활문화와 깊은 관련이 있는 전통나무 중 수종을 대표할만한 우수한 자원으로 확인되었다. This large Chinese hawthorn stands 9.0m tall with a girth of 2.0m. The estimated age is about one hundred fifty years. 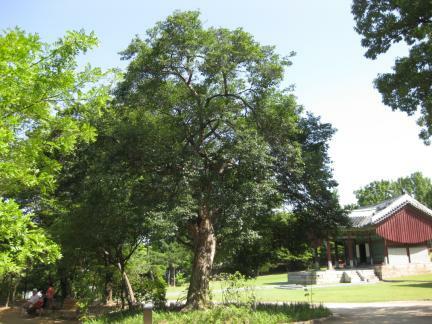 Its sizeable trunk, the distinct ridges on the stems and its attractive overall shape make this tree a great example of large Chinese hawthorns in Korea. Its location, in the graveyard of Lady Eom, Consort to Gojong, endows it also with cultural significance. The large Chinese hawthorn produces white blossoms in late spring and small red fruits (haws), similar in appearance to ripe apples, in autumn. According to Joseon Wangjo Sillok (Annals of the Joseon Dynasty), haws from large Chinese hawthorns were used as an antipyretic. They were also used to make medicinal liquor. 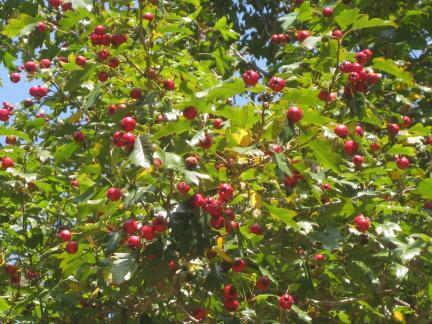 Large Chinese hawthorns of good size, like this one, are extremely rare today. Most cultural heritage-designated trees are village guardian trees, many of which are large old gingko, pine or oak trees. Meanwhile, other types of trees that have long been part of the daily living environment in traditional times, also deserve conservation attention. Due to the change in lifestyle, many of these trees are today left unattended or are disappearing rapidly. 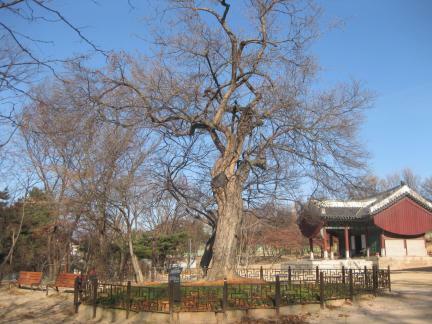 This tree at the Yeonghwiwon Royal Tomb was deemed a representative specimen of large Chinese hawthorns, a tree species occupying an undeniable place in the history of everyday life in Korea.